Everybody knows latkes are made out of potatoes. Heck, the Wikipedia page even redirects to “potato pancakes” — and if Wikipedia says it, it’s most certainly true. But consider this: Jews have been celebrating Hanukkah since the Maccabees successfully took back and rededicated the temple in the second century BCE, yet potatoes did not become available to them until well after Columbus’s voyage at the end of the 15th century CE, 1,700 years later. That’s a lot of latke-free Hanukkahs! That would be a problem, if tradition specifically called for eating latkes, but that particular practice emerged relatively recently among the Jews of Europe. All that’s really needed is fried food — the oil it is fried in calls to mind the miracle of the days supply of ritual olive oil burning for eight days that Hanukkah commemorates. The fritters themselves have varied throughout the years according to local practice and availability. Enter the turnip: this venerable old-world brassica would certainly have been available to Jews in the second century BCE, and it fries up to a mean little fritter. If you’ve got a couple of turnips kicking around the bottom of the crisper drawer you don’t even need to wait till Hanukkah (which is like a year away at this point) to enjoy these. By the way, a religion with eight days dedicated to eating deep-fried foods? That’s something I could believe in — other than the whole giving up pork thing, of course. Peel the turnips and coarsely shred them. I use a food processor. Toss the turnip shreds with the salt in a medium bowl and let sit for a half hour, allowing the salt to draw out some of the moisture. After thirty minutes have elapsed, squeeze the turnip shreds (in your hands or in a kitchen towel) to extract as much moisture as possible. Turnips hold a lot of water, so squeeze hard. Mix the turnips with the eggs, flour and black pepper. Heat olive oil in a skillet over medium-high heat (you’ll have to use your judgment on how much — it should be no more than what would come halfway up the sides of the latkes but I used substantially less). When the oil is hot, take golf ball-sized dollops of turnip mixture and place them in the pan, pushing them as you do to flatten them into rough disks. Repeat until the pan is full. Fry the latkes until they are golden brown on the first side, then flip and fry until golden brown on second side. Remove from oil, drain on paper towels, and season with additional salt. You can serve the latkes with sour cream or apple sauce but they are also great au naturel. This entry was posted by Tom on Thursday, December 16th, 2010 at 8:21 am and is filed under Recipes. You can subscribe to responses to this entry via RSS. Tom, this is excellent. 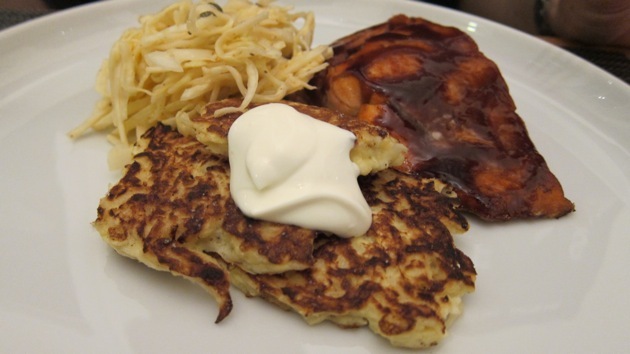 I recently made some mixed-root “latkes” that were very good–were there turnips in there? Could have been. I appreciate your extolling the virtues of the under-appreciated “neep,” but what I really like about this is that you now have a subject tag for Maccabees…. Well, we do now anyway!